Lunar landing module by Cartier, French; made of yellow gold, white gold, black lacquer, and red, white, and blue enamel. NEW YORK — From twinkling stars and graceful comets to glowing rockets, space has been a popular subject for jewelers throughout history. Now an exhibition draws together choice examples of space-themed jewelry from before the space race to today. On display at the Forbes Galleries from March 16 through Sept. 7, "Out of This World! Jewelry in the Space Age" showcases stunning items of adornment such as a rocket-shaped diamond brooch, a necktie featuring the solar system's planets made of precious stones, and a large collection of pins, earrings and other baubles themed after Sputnik, the first human-made satellite. Tampa necklace by Van Cleef & Arpels, French; Made of white and yellow gold with round-, baguette- and rose-cut diamond, round pink, purple and yellow sapphire, rose-cut blue sapphire, onyx, round orange garnet, round red spinel and round beryl. Karlin had no trouble finding ample space-themed pieces for the show. Her favorite items include a diamond necklace from French jeweler Van Cleef & Arpels made in 2010 that was inspired by Jules Verne's 1864 novel "From the Earth to the Moon." "That necklace is truly incredible. It is oneofakind. It's just gorgeous. It takes everybody's breath away," Karlin told SPACE.com. 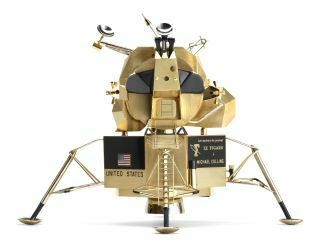 Another showstopper piece is a model of the Apollo 11 lunar landing module made of yellow and white gold by French jeweler Cartier. The model was made in Paris in 1969, the same year as the first manned moon landing, and given to Apollo 11 astronaut Michael Collins. The exhibition also features jewelry that doesn't, on the surface, seem to have anything to do with space, except that it's actually been there. These items include earrings worn in space by astronaut Cady Coleman and a West Point ring worn to orbit by astronaut Ed White during the Gemini 4 mission. White tragically died during the Apollo 1 ground fire in 1967, and the West Point class of 1978 pooled resources to buy the ring and display it at the school in White's honor. West Point ring worn in space by astronaut Edward White, made by L. G. Balfour Co., American, of 14 kt gold. White wore this ring as the first American to walk in space during the Gemini 4 mission. He tragically died in the Apollo 1 fire. "I quickly learned that anything that's been flown in space is very valuable," Karlin said. "The pieces don't look different from any other piece, but just knowing these have been to space makes them very interesting." Space has a natural grace and glamour that have made it appealing to jewelers throughout history. Even before people flew to space, or understood the objects in the heavens in the way we do now, humans have been focused on the night sky. "Of course it goes back to ancient times," Karlin said. "Egyptians had the sun god and the moon god depicted on pectorals [brooches], and the Chinese had a big affinity with the moon." Space-themed jewelry got a big boost in the Victorian period after Halley's comet appeared in 1835 and then again in 1910. And the simple, iconic shape of Sputnik made an indelible impact on jewelry design at the dawn of the space age. More recently, the cosmic images of galaxies and nebulas beamed back from observatories such as the Hubble Space Telescope have no doubt influenced contemporary designers who've integrated swirling Milky Way and colorful planet designs into their work. Ultimately, the way jewelers of any era incorporate space themes reflects larger preoccupations of their time. "Studying jewelry is like a window into a time period," Karlin said. "Jewelry is not made in a vacuum. It comes from somewhere. If there's something going on in terms of political events, current events, if there's a war, all of those things can be seen in jewelry. It's a much more fun way to study history."